The Twins have not been idle since their season ended, but significant moves are still to come. Prominent among them, of course, is the hiring of the new manager. The choices have apparently been whittled down to Paul Molitor and Torey Lovullo. I have no real objection to either, although, as I've said before, my (relatively ignorant) preference was/is Doug Mientkiewicz. But I will readily admit that Terry Ryan knows far more about those three than I do. The Twins have reinstated Mike Pelfrey to the 40-man roster, giving them 19 pitchers, three or four catchers (the roster listed on their website this morning has Chris Herrmann as an outfielder), eight infielders and six or seven outfielders. That's 37 players. I've got to think some more deletions are coming. The three I think are most likely on the bubble: OF-C Herrmann, 1B Chris Colabello and RHP A.J. Achter. Hiring a coaching staff. The incumbents are in limbo pending a new manager. Apparently the Twins have not been approached by other teams for permission to talk to any of them for outside jobs. I think it's safe to presume that Rick Anderson and Scott Ullger will not be back regardless of who the new manager is. And I suspect that Tom Brunansky will be. The rest, I don't know. I've suggested before that Joe Vavra may return to his previous job as minor league hitting coordinator. The pitching staff. It wasn't good last year, and it's clogged with veterans who are essentially in the way of Meyer, Trevor May and Jose Berrios. We can reasonably figure that Phil Hughes isn't going anywhere. But I have to believe that somebody from the foursome of Kyle Gibson, Ricky Nolasco, Tommy Milone and Pelfrey will depart by spring training. A role for Ron Gardenhire. The Twins are going to pay him for the next year anyway. They might as well get something for the money. Gardenhire has not been publicly linked to any of the managerial openings this winter (Tampa Bay has one now), so that resolution seems unlikely. celebrate the final out Wednesday night. Nicely done, Madison Bumgarner. Nicely done, San Francisco Giants. This makes three World Series titles for the Jints in five seasons, and while I don't think they're a great team, they've had a knack for finding the right people for the right roles in October in even-numbered years. This year it was Bumgarner, the lefty slinger who stopped the Royals pretty much dead in two starts, then gave manager Bruce Bochy five shutout innings of relief in Game Seven. 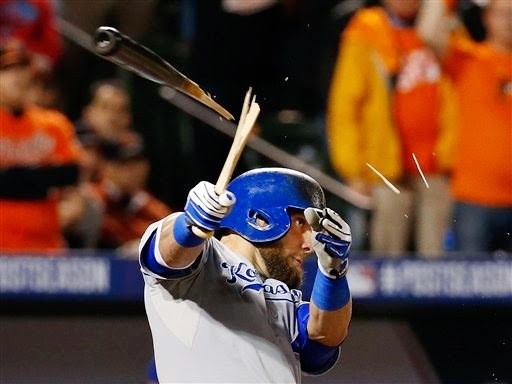 We can wonder why Kansas City skipper Ned Yost never let Josh Willingham out of the dugout against Bumgarner -- the purpose of having the Hammer on the roster was to hit lefties, after all. We can wonder what would have happened had Alex Gordon run out of the box on his ninth inning hit that Gregor Blanco and Juan Perez misplayed into three bases. Might he have scored? We can wonder why Yost had Alcides Escobar bunt on an 2-0 count in the fifth inning after Bumgarner opened his outing by allowing a base hit. Giving Bumgarner a free out there certainly didn't hurt him. We can wonder and what-if, but what happened happened, and what happened was the Giants winning the title. One aspect of the Giants' staggered string of championships -- 2010, 2012, 2014 -- is how few pieces have been consistent from title to title. Buster Posey behind the plate, certainly. Bumgarner in the rotation -- although in 2010 he was in the back of the rotation and now he's in the front. Sergio Romo, Santiago Casilla, Jeremy Affeldt and Javy Lopez in the bullpen, although the first two have changed roles repeatedly and the latter two are essentially lefty specialists. The Giants have had three different center fielders for their World Series runs, and three different second basemen. Twice, in fact, the Giants changed second basemen in midseason and went on to win the title. Pablo Sandoval sat for most of the 2010 World Series and hit cleanup in 2014. Tim Lincecum was a rotation mainstay in 2010, a useful reliever in the 2012 postseason, an afterthought this year. What we have in the Giants, then, is a multiple-time champion that has had to retool on the fly, each champion sharply different than the one that preceded it. This is rare. Baseball history is filled with dynasties (or at least pretenders to such status) that relied on the same core. Few have had to rework the puzzle as completely as these Giants have. Casey Stengel's Yankees, perhaps. It's no small accomplishment. The 2014 postseason, at least up to the World Series, had been marked by extremely close games but one-sided series. The World Series, on the other hand, has been the opposite. 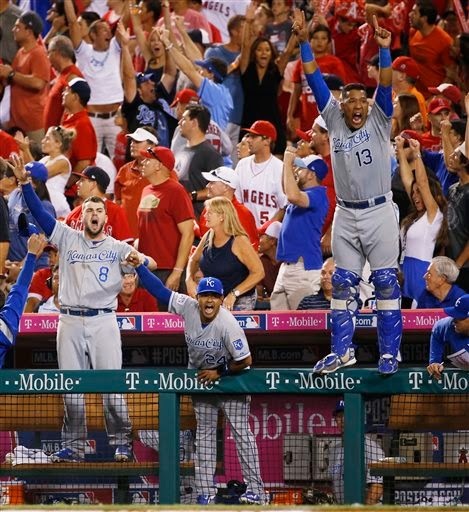 Only one of the first six games have been close (Game Three, won by the Royals 3-2). Yet the series is going to a Game Seven. Close games, even in a series that ends quickly, are more entertaining than a string of non-competitive ones with alternating victors. But today's winner-take-all finale has a chance to be memorable enough to carry the Series. So what should we expect tonight? San Francisco will start veteran right-hander Tim Hudson. He's 39 and has at least a borderline Hall of Fame case. He also hasn't gotten a win since August. I will be surprised if either starter lasts past the fourth inning. The key, should Hudson in particular falter, is how much the Giants can get out of ace starter Madison Bumgarner in relief on two days rest. The Royals can splutter against lefties, but San Francisco's lefty relievers are not multi-inning guys. Looking at Guthrie's career: He has led the league in losses twice, hits allowed once, home runs allowed once and HBP once. He has never led the league in a good category. Hudson has also once led the league in HBP. He has also led in wins once, winning percentage once, games started once, shutouts twice and lowest HR per nine innings once. All those positives, however, came at least 10 years ago. Hudson is a four-time All-Star and has four times gotten Cy Young votes. Guthrie has never gotten any such recognition. I think they're pretty similar pitchers right now, however. And they'll be on short leashes tonight. Byron Buxton on Monday afternoon was named to play in the Arizona Fall League's "Fall Stars" game. On Monday evening he dove for a ball and left with an injury. The Twitter reports were contradictory and confusing. It was his wrist. No, he dislocated a finger. No, it's a jammed finger. It's his left hand. No, it's his right hand. Buxton has, in this calendar year, twice injured his left wrist, initially diving for a ball in the outfield and then on a slide while running the bases. He also sustained a significant concussion in an outfield collision, also diving for a ball. All these injuries have limited him to fewer than 200 plate appearances in High A, Double A and the AFL. It all makes me wish Buxton could commune briefly with the ghost of Earl Weaver, the legendary manager. Weaver didn't want his fielders diving for balls. His contention: It raises the risk of injury, and if the ball is missed, it worsens the result by taking the fielder out of the play. An outfielder's dive can turn a single into extra bases; an infielder's dive makes him slow in getting into cutoff position or covering a base. In Buxton's case, fewer dives figures to mean more time on the field. We'll never know how good he was going to be. Oscar Taveras, a 22-year-old outfielder for the St. Louis Cardinals and long touted as one of the brightest prospects in baseball, died Sunday in an auto accident in his native Dominican Republic. Also dead in the crash was his 18-year-old girlfriend, Edilia Arvelo. And, basically, never got going. By season's end, manager Mike Matheny was publicly questioning Taveras' work ethic and conditioning. Some observers outside the organization questioned Matheny's patience with the megaprospect. In Matheny's defense, he was in a pennant race, he gave the rookie almost 250 plate appearances, and the rookie didn't hit. Taveras was on the bench for the playoffs. He had three hits in seven pinch-hit appearances in the playoffs, including an important home run, but never got a start. 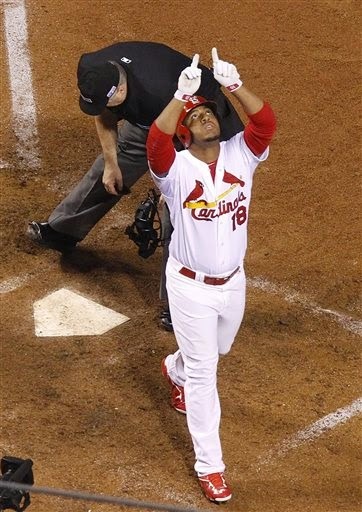 Still, the Cardinals were penciling Taveras in for the right field job next year. They were counting on him turning into a middle-of-the-order force. And now that won't happen. "Tomorrow isn't promised to any of us," Kirby Puckett said when he announced his retirement in 1995. Taveras has had his final today, and we all have lost something. 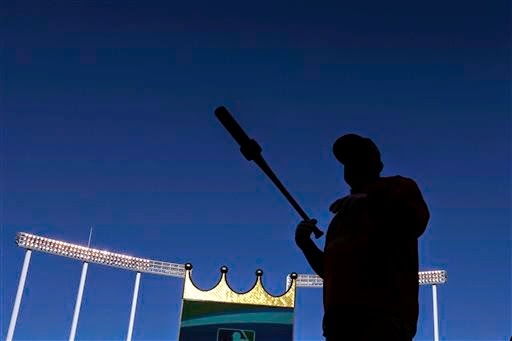 batting practice at the Kansas City ballpark on Monday. October, and the shadows are impressive. 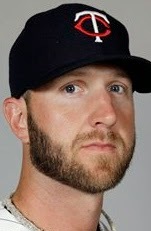 was going to remain with Tampa Bay; now he's fled. 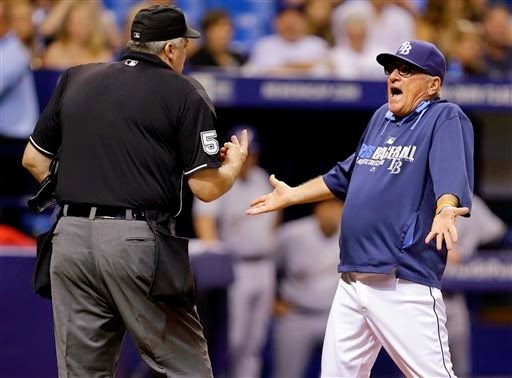 Joe Maddon has built himself a reputation as one of the sharpest managers in baseball in his nine seasons at the helm of the Tampa Bay Rays. Only one other team is without a manager at this point. The Twins. Maddon's reputation is such that other teams will be willing to create an opening in order to land him. That might be a delicate operation, however, since the ethos of the managerial trade holds that one does not pursue a job someone else holds. The choreography involved in getting Maddon into the dugouts of the Cubs or Dodgers -- to name two teams immediately connected with him -- will be interesting indeed. This is, no doubt, part of why some clubs (notably the Dodgers, where Friedman is now in charge of baseball operations) have already publicly declared that they won't pursue Maddon. What else are they going to say? Yeah, if we can get him, we'll fire our guy in a heartbeat, but until we do, our guy is still our guy. That might be the honest answer, but it's not one any general manager can give. For one thing, it would kinda dampen the enthusiasm of the incumbent. Terry Ryan is the one GM without that problem. He indicated Friday that he'll at least gauge Maddon's interest in the Twins job. That, I'm guessing, is where it will end. Not because of money necessarily, but because of the circumstances. It's worth noting that Maddon is not particularly young -- he's 60, a few years older than Ron Gardenhire and Paul Molitor and 20 years older than Doug Mientkiewicz. One might well doubt his interest in tackling a project as opposed to a ready-to-win club, all the more so since all indications are that Ryan intends to slow-play the arrival of Bryon Buxton and Miguel Sano. If Maddon wants to play in a sandbox with a flock of young talent, he can probably go to the Cubs (who have a manager in Rick Renteria but no deep commitment to him) and have them in the majors without waiting. If he wants to manage a veteran squad, the Dodgers probably would rather than him than Don Mattingly. Back on July 11, I saw something unique: Jake Reed gave up an earned run. This needs a bit of explanation as well as a disclaimer. 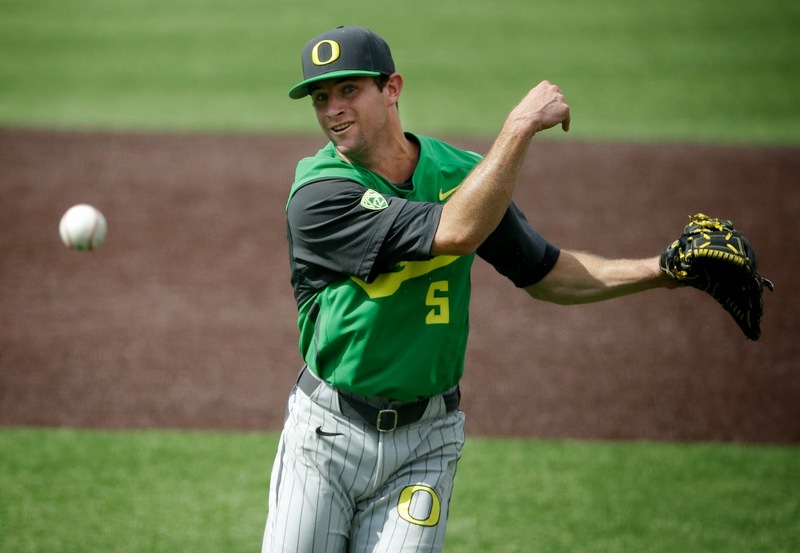 Reed -- no relation to the former Vikings wide receiver of the same name -- is a right-handed relief pitcher in the Twins system, selected and signed as a fifth round pick last June out of the University of Oregon. He blew through Appy League hitters in four appearances (six innings, one baserunner allowed, eight strikeouts, no runs) and moved up to Cedar Rapids in the low-A Midwest League in time for me to see him work during my early July visit. On July 11, he was selected to "start" the continuation of a suspended game with the Clinton LumberKings. It was a slightly goofy spectacle; the game had started at Cedar Rapids, so the Kernels were the home team, but the continuation was in Clinton. Reed went two innings and gave up a run, but the Kernels came back in the bottom of the 11th for two runs and the win. And I wasn't impressed enough to include Reed in any of my posts from that trip. But that was the only earned run he gave up with the Kernels. And so far he's been unscored upon in the Arizona Fall League as well. Now, Reed is going to give up runs at some point. Nobody's THAT good, and if he was, he wouldn't have lasted until the fifth round. But he's certainly making a good early impression as one of a raft of impressive bullpen arms in the Twins system.. The Twins removed two pitchers from the 40-man roster Wednesday, but as far as I'm concerned the most significant news involved a pitcher who isn't on the 40. That would be the bad medical news about Mason Melotakis, a left-hander the Twins took in the second round of the 2012 draft. Melotakis was a reliever in college; the Twins used him in the rotation in 2013 at Cedar Rapids, then returned him to the bullpen last year, He shot up to Double A by season's end, running his fastball velocity up to a reported 97 mph. I had hopes that he'd power his way onto the major league relief corps next year. Won't happen; he had Tommy John surgery this month, so no pitching for him at least until late next year. The Twins declined the team option on Jared Burton, so the righty becomes a free agent. He spent three years in the Twins bullpen with ERAs of 2.18, 3.82 and 4.36. That's a pretty obvious pattern, and he'll turn 34 in June, so it wasn't a particularly surprising decision. The Twins sold Kris Johnson to the Hiroshima Carp in Japan. Good for Johnson, who will get a seven-figure salary, something that doesn't seem particularly likely for him in the States. Johnson had a fairly decent year at Triple A Rochester last year, but he figured to be a long way down the rotation depth list if he stuck around. The Twins now offically have 35 slots filled on the 40, with Mike Pelfrey (60-day disabled list) still to be restored, I fully expect more deletions. Kansas City won 89 regular season games, seventh most in the majors. San Francisco won 88, tying with Oakland for eighth. Neither won its division title. But one of them will win the World Series. Which prompted me to wonder: What was the weakest World Series champ? I'll base this on the teams relative to their time. I am quite certain that baseball today is played at a higher level than in the past. It's certainly played differently. And this list will be heavy with relatively recent teams. It has to be, because for generations, the World Series always pitted the teams with the best records in their respective leagues. That hasn't been guaranteed since 1968, and as the playoff entrants have inflated, the chances of a team with a lesser record winning has increased. So I start with the 1959 Los Angeles Dodgers, who somehow won the National League pennant with 88 wins, a total they reached only because they had to win a best-of-three series with the Milwaukee Braves after they finished the 154-game schedule of the time with 86 wins apiece, an absurdly low total for a pennant winner. The Dodgers were probably only the third best squad in the league, but they prevailed. Next up, a team close to my heart: the 1987 Minnesota Twins, winners of 85 regular season games and outscored for the season. Four American League teams had better records than the Twins, but they were all in the other division. They are quickly followed by the 1988 Los Angeles Dodgers, who won 94 games although it's hard to see how. Orel Hershiser was great, Kirk Gibson won the MVP, and Tim Leary and Tim Belcher gave them two more sub-3.00 ERAs in the rotation. There's not much else there. But they beat a 100-win Mets team in the playoffs and a 104-win Oakland team in the Series. Once we get into the wild card era, the chances for mediocre records to win it all multiply. The 2000 Yankees only won 87 regular season games, but I'm inclined to cut them some slack because 2000 is the Yankes' third straight World Series win. The 2006 St. Louis Cardinals won just 83 regular season games, which is hard to figure. They'd won 100 the year before, 105 the year before that. Winning in '06 is something of a make-up for not winning the previous years with better teams. Still, 83 wins is the all-time low for a World Series winner, and I sure hope we never have a champ with less. I'm never going to be all that impressed by the credentials of any wild card team, even though we've seen a number of them win (the Marlins in '97 and '03, the Red Sox on '04, Cardinals in '11). We'll have another one soon. But I don't think either is as unlikely a champion as the four teams linked to above. My choice as the weakest Series champ? I'll take the 1987 Twins, and say it's better to be the weakest team to win the World Series than the strongest team that didn't. Word Monday was that the field of candidates for the Twins managerial job was narrowing. If so, the known candidates are down to the three insiders (Gene Glynn, Doug Mientkiewicz and Paul Molitor) and one outsider (Torey Lovullo of the Boston Red Sox). Person with direct knowledge confirms second meeting set for Tuesday between Paul Molitor and Terry Ryan regarding #MNTwins mgr opening. I'm still rooting for Mientkiewicz to get the job, but these reports hint that Molitor's going to get the job. It's been easy to forget over the course of the long layoff, but the World Series starts tonight. I expect this series to ultimately boil down to the power arms of the Kansas City bullpen versus the fastball-hitting middle of the San Francisco lineup. How good are the Giants against high velocity? SF hitter ranks (among 150 qualified in MLB in '14) vs. fastballs of 95+ mph: 6. Pence, .373; 10. Posey, .344; 29. Sandoval, .322. I frequently see a series like this as turning on a strength vs. a weakness. In this case, I see a strength versus a strength. That's harder to call. I'll take the Royals in this matchup, but I'm not particularly comfortable with that call. Ron Gardenhire was ousted as Twins manager on Sept. 29. Three weeks and at least eight candidates later, Terry Ryan is apparently still not ready to make a hire. With the World Series starting Tuesday and the usual pressure from the commissioner's office to avoid significant moves during the series, it seems likely there will be no hire before November. This is, presumably, not a good sign for the internal candidates, who were the first to be interviewed. Ryan pledged a wide-ranging and diverse search, but we might reasonably infer that, at this point, Ryan still hasn't found what he's looking for. Or there's this possibility: Ryan is using the opportunity to grill prospective managers from outside the system to gain new ideas and insights more than to actually select the next skipper. The Twins have been criticized in some quarters as too ingrown and rooted in its own culture. All the known outside candidates -- Sandy Alomar Jr., Chip Hale (out of the running), Demarlo Hale, Torey Lovullo and Joe McEwing -- come from American League teams. They may be telling Ryan things about the Twins that he hasn't heard from within, giving him an outside perspective on his operation -- knowledge that may be useful even if he hires one of the insiders. Even if Ryan waits until November to make his selection, it will still be faster than the process that resulted in Ron Gardenhire getting the job. That hire didn't come until January 2002. 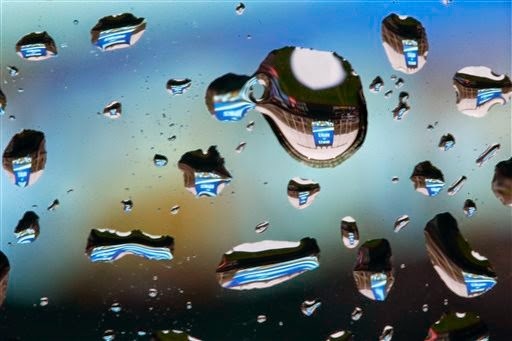 Kaufmann Stadium scoreboard through the water drops. Every once in a while The AP moves a photo -- and labels its an "APTOPIX," indicating that it's among the best work of the day -- that leaves me puzzled. What newspaper ran this photo, I wonder. And why? Arty, OK. I'll buy arty, As photojournalism, it lacks something. 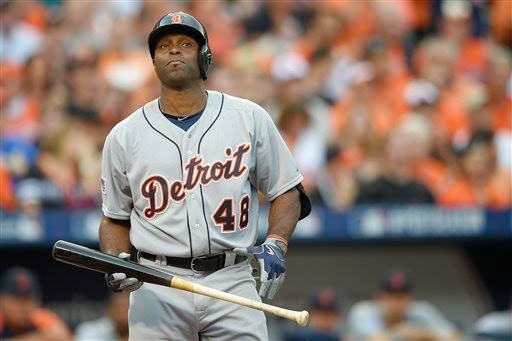 Torii Hunter is 39 years old. He played like it this year. I've been seeing in recent days tweets and blog posts from people who really ought to know better suggesting that the Twins bring back Torii Hunter (to play left field). Or Jesse Crain (to pitch middle relief). Dear Lord, no. This year's Reunion Tour (Jason Bartlett, Jason Kubel, Matt Guerrier) was bad enough. Let's not do Reunion Tour II. There is nothing in the business of signing 30-something free agents in decline that helps the Twins at this stage. This is not a contending team; Hunter and Crain aren't going to help the Twins win a divisional crown. They will get in the way of playing the guys who might someday help the Twins win a divisional crown. They won't plug holes so much as block roads. Leadership? I am increasingly convinced that "leadership" as defined by big-city columnists means "accessible, gives good quotes." Hunter is that. As a player, he is emphatically in decline. (A decline, I will concede, that came about five years after I expected.) Baseball Reference's version of WAR puts him at 0.4 in the season just completed; Jordan Schafer, in a fraction of the playing time, was at 0.3 with the Twins. Again: on a per-out basis in the American League, Jordan Schafer was better. Crain? He hasn't pitched since midseason 2013, and what's more, he hasn't come close to being ready to pitch. He's 33 now, he blew his arm out throwing slider after slider with the White Sox, and the only purpose for a team in the Twins' position to sign him is on the chance that they can flip him for someone useful at the trade deadline. I say that potential benefit is outweighed by the obstacle he'd pose for younger arms. I do think the Twins need to reconstruct their bullpen. An injury guy in his mid 30s is not the way to do that. DeMarlo Hale, currently the Toronto Blue Jays bench coach, apparently got a under-the-radar interview a few days ago with the Twins for the managerial vacancy. 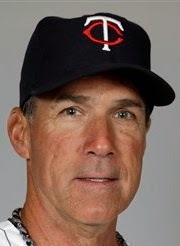 Hale, 53 and black, gives the Twins a second minority candidate for the job. Hale was a minor league infielder in his playing days who never rose above Double A in five seasons in the Boston and Oakland organizations in the 1980s. Most of that time was spent in the Red Sox chain; only in 1988 was he with the A's. I don't know how much contact if any he would have had with Tony LaRussa, who was the A's manager at the time. None of his minor league managers skippered in the majors. He had a nine-year run as a minor league manager (1993-2001), mostly with the Red Sox but also with Texas, and had had a series of of major league coaching jobs since then. Among the managers he's worked for as a coach: Buck Showalter in both Texas and Baltimore; Terry Francona in Boston; and John Gibbons in Toronto. Eight games in the postseason for the Kansas City Royals. Eight wins, no losses and a trip to the World Series. Not bad at all for an 89-win wild card team. Nobody who enjoyed the Twins World Series title in 1987 as much as I did has any right to sneer at a sub 90-win team going to the Series. But I knew then that the Twins weren't really the best team in baseball, much less in the American League. They happened to get into the postseason and get the wins they needed to get. Similarly, these Royals are not the best team in the Central Division, much less the best team in the American League, Their record says so. But they are unbeaten in the three rounds -- wild card game, divisional series, league championship series -- they've played. This run is likely to be overthought and overanalyzed in coming days, and in truth this post might be a good example of that. But in my view, this Royals rampage emphasizes the difference between regular season baseball and post season baseball. The regular season is, broadly speaking, a game a day. Six or seven games a week, more or less, for six months. This ain't football. We do this every day, Earl Weaver said years ago, and it remains true -- during the regular season. The postseason is another case altogether. October baseball is not an everyday affair. The Royals have yet to play on three consecutive days this month. The regulars don't need, or get, the days off they do in August, so a pinch-running specialist can be carried. The pitching depth -- the fourth and fifth starters -- is less important. A six-man staff can carry you through October, but that approach won't work in the regular season. The Royals have an eight-game winning streak going -- and they have done that without getting six innings from any starting pitcher.It been five innings or so, and here come the relief pitchers. Here, the Royals are without peer. They have Kelvin Herrera, Wade Davis and Greg Holland -- three robust right-handed power arms with ERAs this year of 1.41, 1.00 and 1.41 respectively, with a combined 258 strikeouts in 204.1 innings. If you're not ahead of this team after six innings with this bullpen rested, you're sunk -- and with all the days off built into the October schedule, this bullpen is always rested. There's more to this surge than just the bullpen, of course. They are the best defensive team in the league, if not the game. And they are finding ways to score enough runs to get to the bullpen, including the long ball, something that eluded them most of the season. 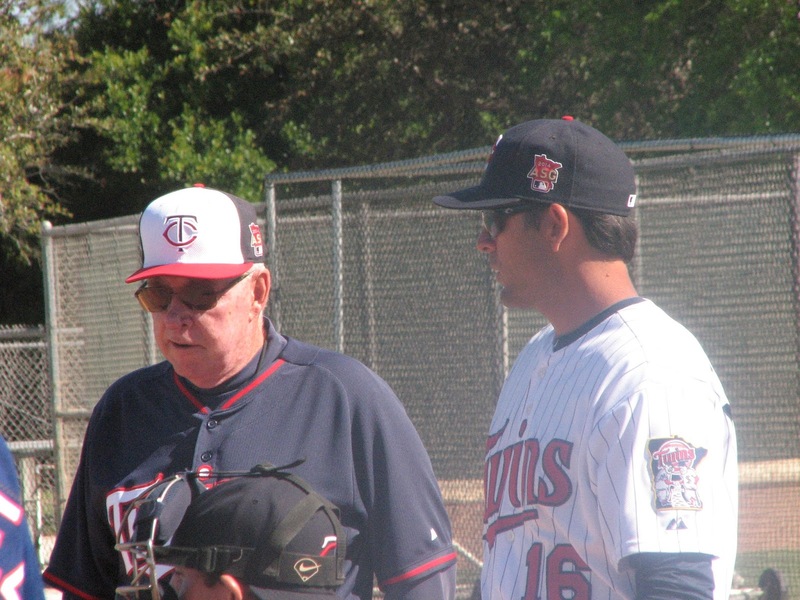 Gardenhire's Twins had two seasons with similarly deep and powerful bullpens -- 2004, with Joe Nathan, Juan Rincon, the briefly healthy Grant Balfour and the rookie Jesse Crain; and 2006, with Nathan, Rincon, Crain, Pat Neshek and Dennys Reyes. But in 2004 Gardenhire didn't trust Crain enough to use him in game situations in the playoffs, and Rincon gave up a crucial homer to Ruben Sierra. And in 2006 the starters and lineup never got the lead to the bullpen. That hasn't been an issue for the Royals. Terry Ryan and the rest of the Twins brain trust are in Fort Myers this week holding the organizational meetings. Even without a manager, even without a coaching staff, some decisions have to be made. The first made public was the removal of infielder Doug Bernier and pitcher Yohan Pino from the 40-man roster. I wouldn't be surprised if the Twins re-signed either or both to minor league deals. Nor would I be surprised if the 34-year-old Bernier wound up with a minor league managing or coaching gig. The Twins now have 37 players on the 40. Mike Pelfrey is still on the 60-day disabled list, which means he's off the 40; at some point he'll be reinstated to the 40, so it's effectively at 38. The Twins will need to clear more space to protect the likes of Miguel Sano, Eddie Rosario and Alex Meyer. Those three are obvious must-protects, and there are other Rule-5 eligible players they probably will want to protect as well, such as Sean Gilmartin, a left-handed starter and former first-round pick. So there are more cuts to come. than the man to his left in this photo, Tony LaRussa. One candidate for the Twins managerial job was scratched Monday. Chip Hale took the job in Arizona. Which leaves the Twins with six known candidates and perhaps more to come. We know of inside candidates Gene Glynn, Doug Mienkiewicz and Paul Molitor, and of outside candidates Sandy Alomar Jr,, Torey Lovullo and Joe McEwing. There's a very real chance that the search is now on hold while one or more candidates now coaching teams in the playoffs -- specifically John Russell of Baltimore and perhaps Jose Oquendo of St. Louis -- finishes the season. Glynn is the proven instructor and minor league veteran. Mientkiewicz is the young gun, just five years removed from his own playing days. Molitor is the Hall of Famer, with all the respect that carries. Alomar Jr. is the Spanish speaker. Lovullo is the guy from the sabermetric organization. McEwing is Mientkiewicz from the outside. If Russell -- who was the first outsider to be specifically tied to the search in media reports -- is indeed a candidate, his pigeonhole would be "the recycled manager." Again, these guys all are more complex than those brief sentences. I prefer Mientkiewicz over the field. Of the outside candidates, including Russell, I prefer Alomar Jr. because of the language component. The Twins have so many Latin players of importance coming up, but their track record with such talent under Ron Gardenhire was spotty. I still expect Molitor to get the job, in part because it's easier to imagine Mientkiewicz on Molitor's staff than vice versa. 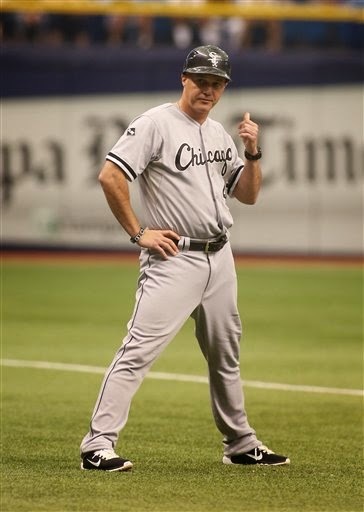 "Super Joe" McEwing, third base coach for the Chicago White Sox, was added to the list of Twins managerial candidates last week and reportedly interviewed during the weekend. He's 41, not quite the youngest of the known candidates (Doug Mientkiewicz is a bit younger), and had a nine-year major league career as a utility man with four teams. McEwing spent the 2007 season at Triple A for the Red Sox, so he was probably exposed to Terry Francona during spring training. His major league coaching career has been entirely on the staff of Robin Ventura, a teammate of his for a while with the New York Mets. What strikes me about McEwing's list is that I can't recall LaRussa being on any other candidate's list. Considering LaRussa's longevity and his stature in the profession, that surprises me. I would have thought that a good list of managerial prospects -- and I believe the Twins have compiled a pretty good one -- would bear more LaRussa fingerprints. Sandy Alomar Jr. was reportedly interviewed during the weekend for the Twins managerial job. 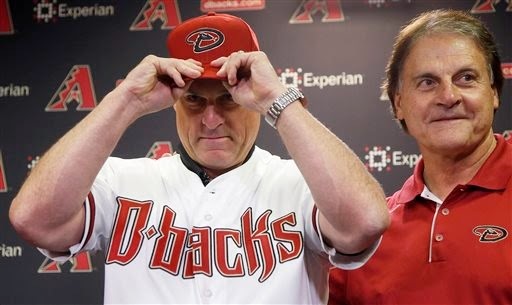 His candidacy may be made moot soon; he's reckoned one of four finalists for the Arizona job as well, and the Diamondbacks are expected to make their hire as early as today, whereas Terry Ryan has hinted that he may take until November to pick a winner. Alomar is from a baseball family. His father, Sandy Alomar Sr., was a durable good-field no-hit second baseman in the 1960s and '70s who went on to be a coach for several teams. His brother Roberto was also a second baseman, one of the 10 best in MLB history. The Alomars are Puerto Rican, and Sandy Jr. is the first known Twins candidate who (a) is of minority heritage and (b) is a native Spanish speaker. Sandy Jr. was a catcher who carved out a 20-year career and was named to six All-Star teams but also had just four seasons of 100 or more games played. We remember him mainly as part of the great Cleveland lineup in the 1990s, but he also played for San Diego, the White Sox (three different times), Colorado, Texas, the Dodgers and the Mets. Two current managers, Showalter and Hurdle, are in that list, and at least one (Guillen) who wants to be back in the mix. As a coach in Cleveland, Alomar Jr. has worked under Manny Acta and Terry Francona. He was the interim manager for six games after Acta's dismissal in September 2012. Labels: managerial prospects, Sandy Alomar Jr. This is what a three-run double can look like. I'm going to say Chris Tillman didn't make a bad pitch here. He was just unlucky. Loading the bases before this swing, that's not all bad luck. There was a lot more to that inning than a broken-bat double. Torey Lovullo, 49, is now bench coach of the Boston Red Sox, an organization that long ago put an emphasis on analytics. He was also an itinerant infielder for more than a decade, bouncing from team to team, organization to organization, getting a month in the majors here, half a season there. Only once did he get more than 100 games in a season. Anderson, of course, is in the Hall of Fame, and Francona, as mentioned in the Mientkiewicz version of this post, is on that kind of track. Piniella has a case for enshrinement. I can't help noticing that Buck Rodgers is on yet another of these lists. He had Gene Glynn in the minors, he had Paul Molitor with Milwaukee. A lot of Lovullo's minor league managers were obscurities, but two names popped out for me: Pat Corrales, former major league manager, and John Wockenfuss, who seemed to rise up the Tiger chain as a manager at the same rate Lovullo rose as a player. Lovullo got more exposure to Wockenfuss than any other professional manager. In a teleconference call Wednesday with season-ticket holders, Terry Ryan said a couple of noteworthy things about Miguel Sano. In an interview Thursday with the Pioneer Press, Ryan walked one of them back. First: The power prospect has no chance of coming north out of spring training, not after missing the entire 2014 season. No real surprise, given the organization's conservative approach to promotions and Sano's long layoff. Second: When Sano does reach the majors, Ryan suggested to the ticket holders, it may be as an outfielder. #MNTwins GM Terry Ryan on Miguel Sano: "Can he play the outfield? Probably. Is he going to? No." "Someone asked me if Sano could play the outfield, and I said he probably could," Ryan said. "He probably could play any position, but let's put that to rest right now. I don't have any interest in moving Sano." Which is fine by me. I don't like the idea of Sano in the outfield. At all. I want this team to get back to fast outfielders who can make the pitching staff better. I don't foresee, even with the hopes for Alex Meyer and Kohl Stewart, a Minnesota rotation of power arms who can thrive without good outfield defense. Sano might make Target Field's left field look small at the plate, but he'd make it look mammoth in the field. In Shipley's story, Ryan goes further on downplaying Sano-to-the-majors, suggesting that we won't see him until 2016. I'm not going to put any weight on that. If Sano is healthy, he'll bash his way to the majors on his schedule, not the front office's. They can start slow with him. He is capable of speeding it up. Triple A player in the Twins system. The Twins today are to interview Oakland bench coach Chip Hale for the managerial post. Hale spent 10 seasons as a player in the Twins organization, 1987-96, then had a year apiece with the Dodgers and the Cardinals. His major league employment record since is scattered; he's had stints as a minor league manager, including winning the Pacific Coast League title one year with the Diamondbacks' Triple A affiliate. There is some disputation in the on-line world as to whether Hale counts as an "outside" candidate. I figure there's got to be some sort of statute of limitations. Yes, Hale spent most of his playing career with the Twins; he hasn't drawn a check from them since. Kelly probably has competition from Melvin for the "title" of most influential figure on Hale as a potential manager. Gene Glynn at spring training in Fort. Myers. Gene Glynn, currently the manager of the Twins' Triple-A affiliate and candidate for the major league job, is something of an athletic legend in the Mankato area: Mr. Basketball at Waseca High in 1975, a star at Mankato State in both basketball and baseball. Unlike the other known in-house candidates who've had interviews, Glynn never played in the majors. He played seven years in the Montreal Expos farm system, then went into coaching. 1994-98: Colorado Rockies, under Don Baylor. 1999: Montreal, under Felipe Alou. 2003-06: San Francisco Giants, under Alou. 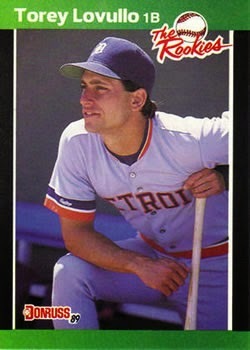 After that, he scouted for Tampa Bay before taking the Rochester job for the Twins. He's kept the Red Wings at or above .500 in each of his three seasons. What he does bring to the table is experience at instructing (his role in the Montreal system before being hired for the Colorado job) and scouting (Tampa Bay). with a start for Triple-A Rochester. This will be a weird winter in the Twins prospect rankings, because their top two prospects, Byron Buxton and Miguel Sano, barely played this year. That's something to keep in mind when perusing Baseball America's fresh top 10 prospects in each minor league. Neither Buxton nor Sano show on these lists, but that doesn't dampen the expectations for either. International League (Triple A): Alex Meyer, right-handed pitcher, is ranked 8th. Trevor May, right-handed pitcher, is No. 17. Eastern League (Double A): Nobody in the top 10. 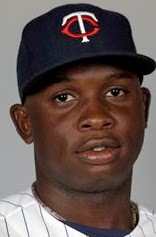 Kennys Vargas, first baseman, is No. 16. Florida State League (High A): Jose Berrios, right-handed pitcher, is No. 6. Jorge Polanco, middle infielder, is No. 14. Midwest League (Low A): Kohl Stewart, right-handed pitcher, is No. 6. Appalachian League (Rookie): Nick Gordon, shortstop, is No. 2. Michael Cederoth, right-handed pitcher, is No. 17. Gulf Coast League (Complex): Nobody in BA's top 20. Comments: The written report on Gordon is the first I've seen suggesting that the No, 5 overall pick might not stick at shortstop. ... Cederoth was the Twins' third round pick last June, behind Gordon and Nick Burdi. Burdi split his season between the Midwest League and the Florida State League and probably didn't have enough playing time to be considered for either list. ... The written report on Stewart matches what I saw in the July game I attended: His mid-90s fastball was hittable. ... We saw three of these players in the majors this summer: Vargas, May and Polanco. after taking a foul ball in the face mask. Catchers, it has been noted over the years, generally age quickly. As we learn more about concussions, it seems reasonable to theorize that foul tips off the mask are no small part of that. 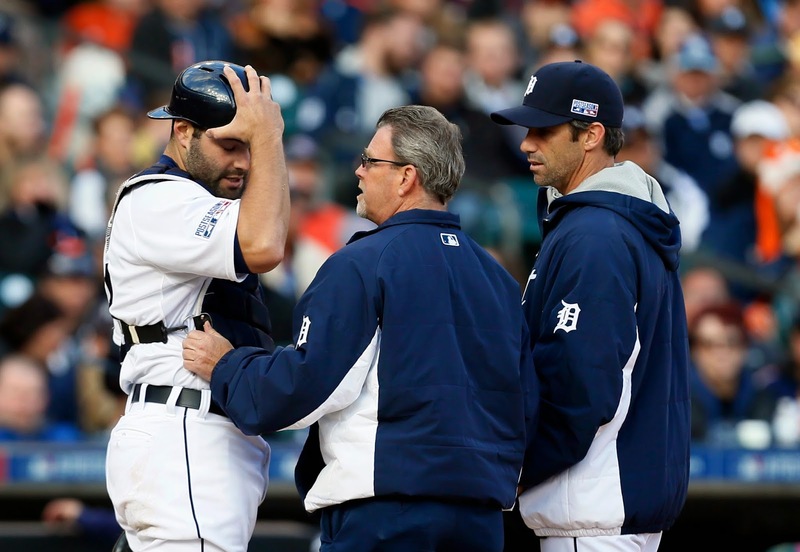 Alex Avila, the Detroit catcher, left Sunday's division series game after yet another foul ball off his mask. This is at least the third concussion he has suffered this season alone, and his second in less than two months. He went on the concussion disabled list last season. He has probably had other concussions that he never admitted. The Tigers season is over with their loss Sunday, so Avila has the rest of the winter to recover. It may -- or may not -- be enough time. Avila was a good hitting catcher a few years ago -- .295/.389/.506 with 19 homers in 2011 -- but he hasn't approached that level since. Which is to say, he isn't Joe Mauer -- a catcher whose bat is good enough to play at another position. If Avila can't catch, he can't play in the majors. And the way his concussions are adding up, one has to wonder if he should catch. It's his life, and his livelihood, and it's not my place to say aye or nay to him. But I expect the Detroit front office will this winter, at the least, line up some alternatives to Avila as the regular backstop. Avila's only 27. But it looks like a very old 27.
homer in the 11th inning Saturday night. Three postseason games for the Kansas City Royals so far. Three extra-inning games. Three wins for K.C. The Royals, the one team in baseball that couldn't hit 100 homers this year, has won two in a row on extra-inning four-baggers. And if they win today, they will have swept the team with the best record in the American League. Doug Mientkiewicz has emerged as the favorite, ever so slightly over Paul Molitor, as the next #Twins manager. And that is everything I know about that statement. No idea how credible Nightengale's source(s) are or if he's merely sucking up to a future possible source or if he dreamed this. I take Terry Ryan seriously. He said he would look at outside candidates and he said diversity was important in this search. So far it appears he has interviewed two white guys from the organization. There will be more to this search. Not quite as distinguished a group as Mientkiewicz's. Via Peter Gammons, this story about Torey Lovullo, Red Sox coach who has been oft-mentioned as a managerial possibility. The Texas Rangers have announced a list of eight candidates who have been or will be interviewed for their managerial vacancy; Lovullo is one of that group. in the navy, during spring training in March. Mientkiewicz has spent the past two seasons managing the Twins in High A Fort Myers, boasting the Florida State League's best record both years and winning FSL playoffs this year. Beyond the won-loss record, it should be a selling point for him that Miguel Sano's best statistical line came while playing for Mientkiewicz, and Byron Buxton and Eddie Rosario also flourished for him in a difficult hitting environment. 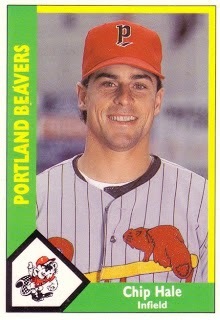 Mientkiewicz's major league career had two segments. He broke in with the Twins, spending all or parts of six seasons in Minnesota, with three and half seasons as the regular first baseman. 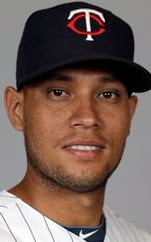 He was then traded in midseason 2004 to make room for Justin Morneau, and that trade triggered the second stage of his career, in which he wandered from team to team as a bench guy: seven teams (counting the Twins) in six years. Lasorda and Torre are Hall of Famers; Francona is certainly on that path. Mientkiewicz would probably say Kelly was his biggest influence, but there are definitely others. Wednesday's wild card game wasn't up to the standard of Tuesday's, but that's a pretty high bar to set. 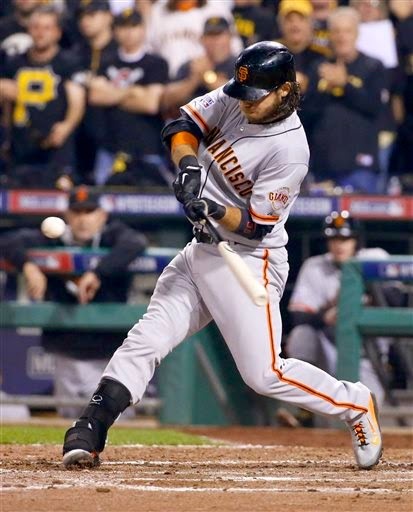 Brandon Crawford, former Mankato Moondog (2005) and current San Francisco Giant, put this one on ice with a grand slam in the fourth inning. Of course, the Giants' Bay Area neighbors for Oakland were unable to sustain a four-run lead of their own in the AL wild card game. 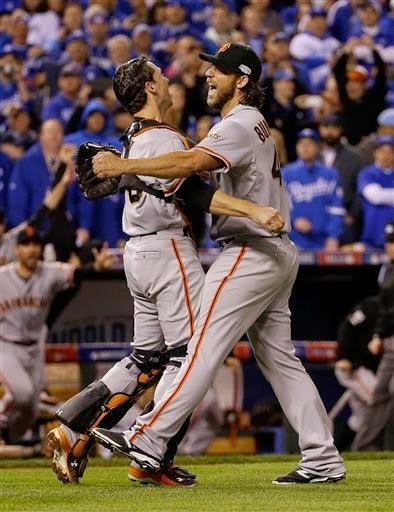 The difference: Jon Lester let the Kansas City Royals back into the game, and Madison Bumgarner did not. AL: Anaheim versus Kansas City; Baltimore vs. Detroit. I'll almost always root for the Midwest team over one from Southern California, and this will be no exception. And while Anaheim is the better team, I'll go with K.C. to take this series. 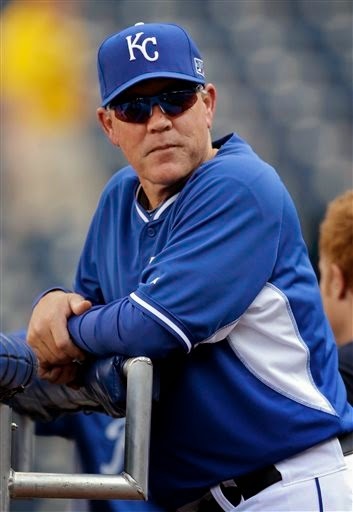 Hope so; the longer Yost is the Royals manager, the better for the Twins. The other series is a genuine test of two postseason power theories. Theory one is that power arms win in October, and the Tigers have a genuine advantage in power arms. Theory two is that teams based on power hitters struggle in October; the weather is colder and the pitchers don't make as many mistakes. Baltimore's offense is based on the home run. Both theories point to Detroit, so that's my pick. As far as rooting goes, I'm torn. I like the Orioles; they were my favorite non-Twins team in my formative years of fandom. I may well find as the series progress that I want the O's. I start without a preference. I see no reason to pick against the Nationals. Deep rotation, solid lineup. Former Twin Denard Span had his best season since 2009 (led the National League in hits) and gives me a rooting interest. The Giants always seem to have enough pitching to be tough in October, but I gotta go with the Nats. The Cardinals and Dodgers? I'd like them both to lose. Only one will, however. And I'll pick the Cardinals to win his one. As for rooting, I dislike both operations, so I'll refrain from making any emotional investment. That was a whale of a ball game Tuesday night, a 12-inning brawl between Oakland and Kansas City. So much ball game. Too bad the TBS crew really wasn't up to the task, prattling nonsense about "Big James James" Shields (postseason ERA entering the contest above 5 runs a game) and blaming Brandon Moss's second-half struggles on the trade of Yoenis Cepedes rather than on a hip injury that needs surgery. Think Ron Darling would like to edit out his seventh inning claim that Jon Lester is "like a machine" pretty much just before the implosion began? Ned Yost found a way to one-run tactic his way back against a four-run deficit. It is, in the long run, self-destructive to try that. On Tuesday, it worked. Which, as a Twins fan, pleases me. Having a division rival get positive reinforcement for silly strategies will only encourage them to continue the silliness. I embrace the bunt more than most internet baseball opinionmongers, but I would not object if, in the process of evaluating managerial candidates, the Twins ran Tuesday's scenarios by the candidates and rejected those who would do that which Yost did. Yost's Royals are, in a sense, a throwback to the baseball I embraced as a young adult, built on speed and defense. Lacking from this team is the artificial turf component of Whitey Herzog's outstanding Kansas City and St. Louis teams. Lacking from those teams, but present in this one (and on the 1985 Royals team that won the World Series two managers removed from Herzog): Power arms in the starting rotation. 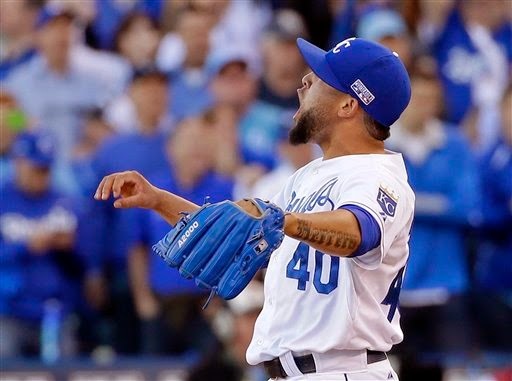 Which brings me to the Yost move that I most object to: His decision in the sixth inning to bring Yordano Ventura into the game with two on, no outs. Ventura is both young and high-velocity. He started on Sunday and threw 73 pitches. Tuesday was his bullpen day, but he had never actually pitched on his bullpen day. Yost has plenty of gas throwers in his bullpen who are used to coming in with men on base. Ventura is not. But Yost went with the tired young starter, who promptly got shelled. Pitching Ventura in that specific situation was the wrong move both for winning the game AND for the future of the team and the player. Yost got away with it. But it was wrong anyway. 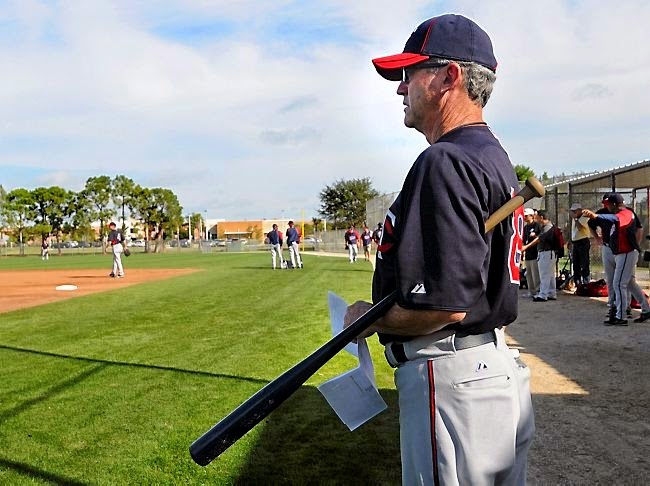 When the Twins dismissed Ron Gardenhire as manager on Monday, they also put the seven coaches "in limbo." They have contracts through this calendar year, but no assurance that they will be on the new skipper's coaching staff. Terry Ryan said Monday that he will not block any of them from moving on to another interested team in the meantime. It should be said that managers no longer have the final say over their coaches, as they once did. That is one of many battles front offices have fought and won over the dugout bosses. Managers do have some say over coaches -- probably most strongly over pitching coaches -- but the general managers have the final say. It's no longer enough to be the manager's drinking buddy. It wasn't Ron Gardenhire's idea to bounce Jerry White and Rick Stelmaszek for Tom Brunansky and Bobby Cuellar two years ago, after all. I rather expect some of the seven coaches to remain on the Twins staff. Indeed, were I involved in the hiring process, I would need a really strong reason to go with a candidate who intended to replace Brunansky or Paul Molitor. Rick Anderson, pitching coach: Can't see that he's returning. Ryan will almost certainly let his new manager have his pitching coach of choice. And it may well be that even if Anderson is the pitching coach of choice (if, say, Molitor or Steinbach gets the job), that Ryan will strongly suggest that a different coach be chosen. Tom Brunansky, hitting coach: I want him to stay. The improvement of the Twins hitters from 2013 to 2014 was impressive. I can't prove that Bruno was responsible for that improvement, but the improvement was there. Bobby Cuellar, bullpen coach: Might be considered for the pitching coach job. Might be kept as bullpen coach, Might be cut loose. My guess is he stays in the bullpen job. Sole Spanish speaker on the current staff, so naturally he was as far from the Latin contingent as possible. Paul Molitor, baserunning/defensive positioning/first base: Conventional wisdom has him as the front runner for the managerial job. The interesting puzzle is: What if somebody else gets the top job? Would the Hall of Famer be willing to serve on a Doug Mientkiewicz staff? I hope so. 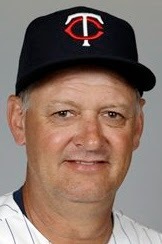 Terry Steinbach, bench coach: Also seen as a managerial candidate. The New Ulm native has also been connected to the Arizona Diamondbacks, where Tony LaRussa has installed Steiny's old Oakland battery mate, Dave Stewart, as a (relatively weak) general manager and is now looking for a new manager. Manager or coach, I expect Ryan to want to keep Steinbach; if the D'backs make a rapid offer, that might not be an option. Scott Ullger, outfield/first base/third base: Can't see that he's returning. Ullger has been around since the Tom Kelly regime and has been given a variety of assignments over the years: Hitting coach, first base, third base, dugout, fill-in manager, outfield defense. He didn't do any of them so well that he kept the responsibility for long. Ullger has long struck me as the most dispensable member of the staff. Bottom line: Even if one of the current coaches is chosen Gardenhire's successor, I expect substantial turnover on the staff this winter. The relative stability that accompanied Gardenhire's assent 13 years ago is not going to be repeated.